A bold design that becomes a landmark in a natural landscape. When architect Luís Rebelo de Andrade first visited Herdade da Considerada, which stretches across 500 hectares, he realized that the area doesn’t have any geodesic markers. Because of this, travelers and visitors could easily get lost in the beautiful but almost uniform landscape. The architect designed House 3000 to become a new reference point in the area. 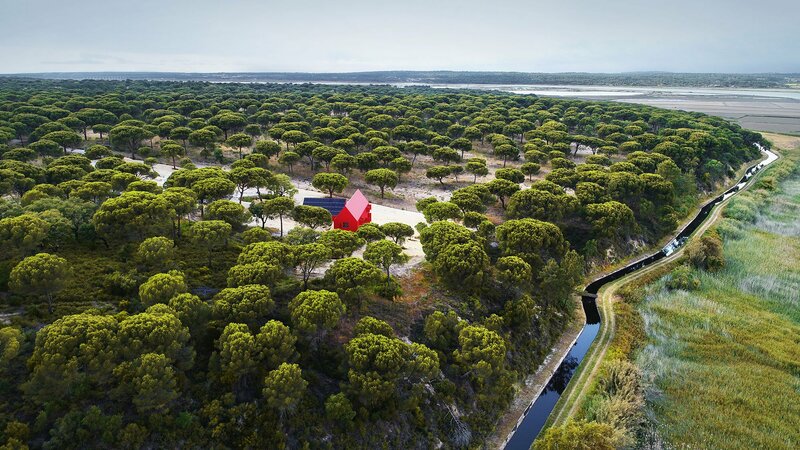 Featuring a bold red color, the structure stands out among the old pines and cork oaks. Located in a secluded area a short distance away from Alcácer do Sal in Portugal, the house provides a respite from urban living. The structure draws inspiration from the stereotypical house shape: a gable roof, simple doors and windows. The architecture intentionally references the first settler houses in the American West, the classic “house on the prairie”, giving another dimension to the design. Beyond the vibrant cladding, the house features a warm interior. Wooden floors, artisanal objects, traditional patterns, and modern furniture combine in an eclectic space that maximizes comfort. Large windows welcome nature inside, framing the views and flooding the rooms with natural light. Outside, a large deck area offers the perfect opportunity to relax while admiring the beautiful surroundings. Both the main house the adjacent farm building minimized construction costs and materials. The architects also focused on sustainability. They installed solar panels and thermal collecting systems which make House 3000 produce more energy than it actually needs. Photographs© João Guimarães – JG Photography, Carlos Cezanne, and Tiago Rebelo de Andrade.